(Nanowerk News) Luleå University of Technology is the first in the world to produce renewable fuels from pyrolysis bio-oil in its facility LTU Green Fuels. Pyrolysis bio-oil is produced by rapidly heating the forest residues in an oxygen-free environment and then rapidly cooling the products formed. By co-gasification with black liquor, a renewable fuel is produced. "We have made a breakthrough developing the new process and managed to get 1 + 1 to be equal to 3. Black liquor makes it possible to gasify pyrolysis oil at a lower temperature, which provides better yield than if the raw materials were gasified separately," said Erik Furusjö, project manager at Luleå University of Technology and head of the project "Catalytic gasification". The university gasification plant LTU Green Fuels in Piteå. By converting forest residues into a liquid, called bio-oil or pyrolysis oil, energy density is increased and transportation facilitated. The conversion of the pyrolysis oil to a renewable transportation fuel is made through a process called gasification. It is performed in combination with black liquor that is a by-product from pulp and paper production and available in large volumes in Sweden and elsewhere. The project "Catalytic gasification" is financed by the Swedish Energy Agency and an industry consortium. In late October the first truck load of pyrolysis oil came to the LTU Green Fuels plant in Piteå. It has now been successfully converted to a renewable fuel. If one truck load of pyrolysis oil is mixed with black liquor and converted into fuel, the total volume is sufficient to drive a car ten laps around the earth. 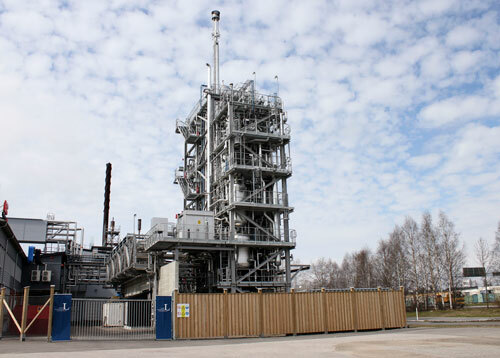 LTU Green Fuels is one of the world's most advanced pilot plants for gasification of various types of biomass into synthesis gas and green fuels. The focus is to replace fossil oil with green fuels. Operations are running around the clock. Through previous research, black liquor has been gasified more than 26,000 hours in the LTU Green Fuels pilot plant in Piteå. The objective of the current program is 1,000 hours of co-gasification of pyrolysis oil and black liquor, which makes a total of about 125 tons of the biofuel dimethyl ether (DME), popularly known as green diesel. This demonstration provides sufficient technical basis to build a large commercial plant using the new technology. When the initial results of the project "Catalytic gasification" was presented at a conference in Chicago (tcbiomass 2015) in early November, there was great interest. A transformation to the new technology, based on feedstocks from Swedish forests can strongly contribute to reducing negative environmental impact. This means that Sweden could achieve the vision of a fossil-independent transport sector in 2030. More than a third of today's Swedish fuel usage could be replaced with the new technology.